Urban shrinkage is rising to the top of the political agenda in Europe as more cities are shrinking in the prolonged economic downturn we encounter. Coupled with unprecedented budgetary austerity and rapidly ageing populations, ‘stagnating’ and ‘shrinking’ cities have emerged as a key challenge for policy and practice for decades to come. Local actors need to find new ways of collaborating across sectors, agencies and disciplines to unlock opportunities for interventions that mitigate the worst effects of urban shrinkage and long-term decline. Future Directions for the European Shrinking City focuses on policy and planning interventions that can be taken by municipalities and their local stakeholders to tackle stagnation and decline. With case studies from a range of European countries this book proposes ways to tackle shrinkage through governance, policy, planning, social, economic and management interventions. Edited by William J.V. 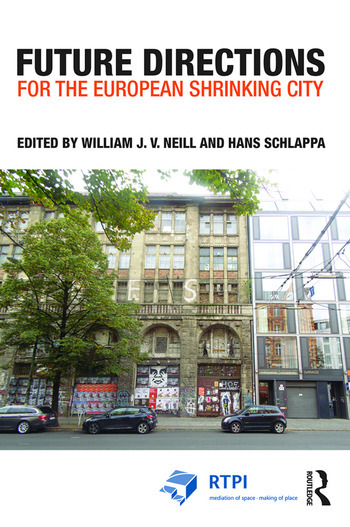 Neill and Hans Schlappa, this book is ideally suited for policy makers and practitioners in urban planning, regeneration, and economic development dealing with pressing spatial and socio-economic issues on a European scale. William J. V. Neill is Emeritus Professor of Spatial Planning at the University of Aberdeen. He previously held academic appointments at the University of Manchester and Queen’s University Belfast. He completed a master’s degree in Urban Planning from the University of Michigan and completed his PhD at the University of Nottingham. He worked as an urban planner for the State of Michigan in the 1970s and 1980s with a particular focus on the shrinking city of Detroit. He is a former Council member of the Royal Town Planning Institute and was recently a member of an EU urban expert (URBACT) group on the future of European shrinking cities. Hans Schlappa is Senior Lecturer in Strategic Management at the University of Hertfordshire. He worked at Aston University and Coventry University before joining Hertfordshire Business School in 2010. Dr Schlappa has led a number of European knowledge transfer projects concerned with urban regeneration and undertaken research for the Home Office, Department of Work and Pensions, Regional Government Offices and Regional Development Agencies as well as a wide range of not-for-profit organisations in the UK. His current research includes projects on leadership in the co-production of public services, social inclusion and community development through place-making, and strategic leadership of cities suffering from long-term decline. Prior to his academic appointments Dr Schlappa managed the development and delivery of a wide range of socio-economic regeneration initiatives in the UK.